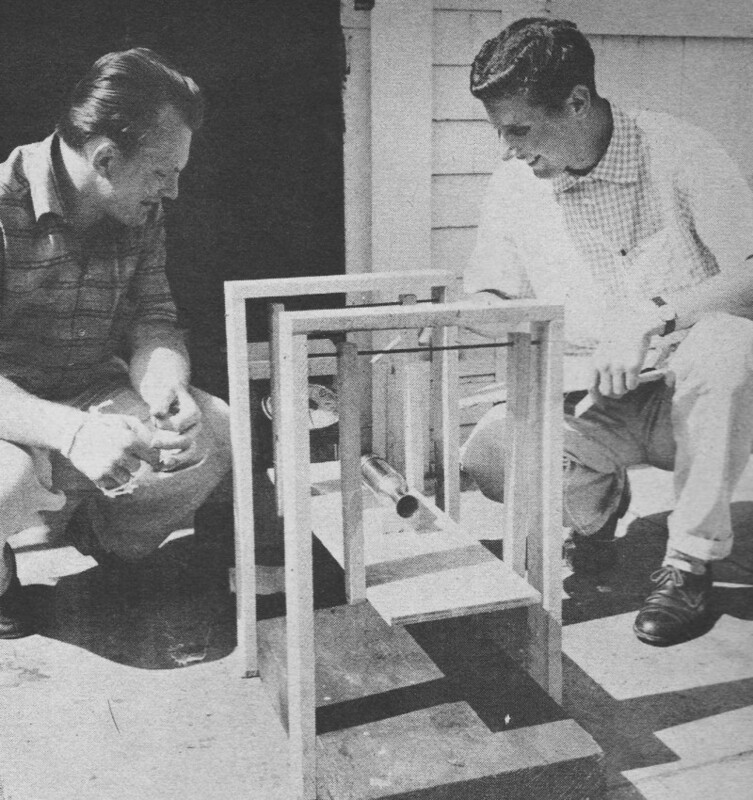 Vernon (Vern) Estes is single-handedly responsible for the prevention of untold eyes, fingers, arms, hair, and even lives, due to his invention of safe, prepackaged, solid fuel model rocket engines. Estes Industries was founded in 1958, the year this article on model rocketry safety appeared in American Molder magazine. 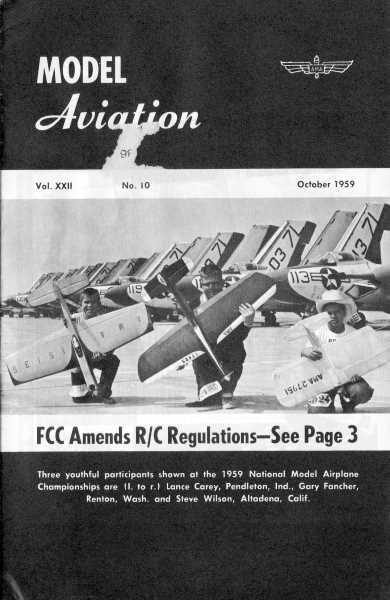 Shortly after Estes began operation, they published a newsletter titled, "Estes Model Rocket News," which had amongst its contents numerous tips on safe handling and use of model rocket engines, and many warning against trying to build your own engines. The thought of kids and even adults handling picrate, the fulminate, and the iodate compounds is enough to send chills down my spine. 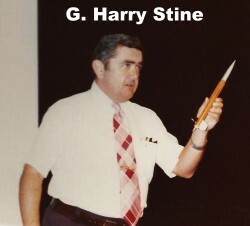 G. Harry Stine, editor of the model rocketry column in American Modeler, printed the Model Missile Safety Code as drafted by the Model Missile Association (MMA, predated the National Association of Rocketry - NAR). Mr. Stine was, BTW, the founder of the MMA. Parallelogram affair used for static tests utilizes very scientific instrument known as the kitchen scales! Don Carlson (left, with bandage on hand from earlier misfire) and Tom DuPont of San Pedro, Calif., Rocket Society. Headlines scream: "ICBM Test Successful! 5,000-Mile Range Reached!" And there, right smack in the middle of Page One is a photo of the missile in flight, spewing a fiery trail a hundred feet long. "If they can do it at Cape Canaveral, so can we! Let's build a rocket and fly it! Rockets are simple! Joe, grab that hunk of gas pipe you've been saving. Dave, dig up that sodium chlorate your dad uses to kill weeds!" Whoa, fellas! We need and want rocket engineers, not hospital patients! Rockets are not simple; if you think so, just ask anybody who has ever worked with them. Rockets can also be dangerous ... if you don't know what you're doing. And, look, you don't know what you're doing! Admit it! You don't even know where to start! Well, I can give you some help on that. But the first thing I'm going to tell you about is safety. You can kill yourself or somebody else with an archery set, a pistol, a car, and even a model airplane if you don't do it right. The same holds true of a rocket. The fact that rockets can be dangerous should not scare you. Other things are dangerous, too. Just recognize the fact! Rockets scare a lot of people, but that is simply because they don't know anything about them. We've got the Model Missile Association functioning now to help answer your questions. MMA has a very strict safety code. Why a safety code? Well, nobody has ever told you anything about rockets. As a result, some of you have left your hair on the ceiling or lost a hand. So, before you even consider doing any work at all with home-made rockets, you've got to know the safety rules and work within them. The Model Missile Safety Code is the result of a lot of study and experience. It combines many of the safety practices of the guided missile industry with some things we have learned from amateur rocketry. It is not intended to unduly restrict your activities. It is merely designed to save your life. It does no good to tell somebody not to do something. You've also got to tell him why. So let's go through the Model Missile Safety Code item by item, and I will tell you exactly why it says don't do so-and-so. Exhaust machined from solid Inconel. Complete unit developed 60-lbs thrust on mixture including unstable, dangerous potassium perchlorate. 1. I will become familiar with the laws, rules, and regulations in my locale regarding the use and handling of rocket propellants and explosive material, and I will obey them. This is simply abiding by the law. It is designed to keep you out of jail. Because of crowded conditions in some communities, there are very stringent laws regulating the possession of explosives which might go bang and take a whole building full of people with them. There may be laws covering combustibles and inflammable materials. Because rocket propellants contain their own oxidizers and do not depend upon the oxygen of the atmosphere for their action, they can be prime, A-One fire hazards under certain conditions. If there are prohibitory laws covering rockets in your vicinity, abide by them. If you don't, you'll get into trouble. During your entire life, you must live within the law or in jail, one of the two. Better get used to living within the law. If you must work with rockets, then go see your local fire chief or police chief and explain your problem to them. If you are conducting your experiments in a true scientific manner under the proper supervision, chances are that they co-operate with you once they understand that you are seriously interested in it. 2. I will never attempt to make own rocket power plant without careful library research into the principles of rocket motors, chemicals and chemical compounds, handling of dangerous chemicals and explosive materials, and related subjects. I get a lot of letters from people who say that they can't find any information on rockets. My reply to that is simply, "You're lazy!" These people haven't looked hard enough or haven't the slightest idea of how to use the public libraries. One of the first things an engineer does when he is tackling a problem is to look up in books the things that may have a bearing on the problem. He tries to find out what other people have done so that he won't make the same mistakes. Don't be lazy. Do some reading. It may save your life. There are hundreds of good books containing a lot of information about small rockets. Any high school chemistry book will give you a wealth of information. Don't think you can just sit down and build up a working rocket. You can't. Rocket engineers spend years and years learning their profession. Even after all this training and years of experience on top of it, they still have rockets blow up on them. What makes you think you're the super-genius who can do it without studying up on it? 3. I will never attempt to make my own rocket power plants without first obtaining help, advice, and supervision from an adult person, science teacher, engineer, or scientist; and I will listen to and follow the advice and instructions given me by those persons. Working without adult supervision in rocketry is like trying to hold school without a teacher. It's something that would be nice, but worthless. Adults have a little more experience in almost everything. In addition, they will see things that you don't. They may be able to save your life by catching some little danger item which you have missed in your enthusiasm to get a rocket flying. And, you will find that someone who knows something about rocketry or its allied sciences can save you a lot of trouble ... provided you are smart enough to listen to what they say. Erosion on nozzle resulting from high temperatures and exhaust velocity. Biggest successful "bird" by SPRS went 8,000' on 30-lb thrust motor. 4. I will never attempt construction or operation of a liquid propellant rocket motor, nor will I work with toxic or dangerous liquid chemicals because of the extreme danger and complexity of liquid propellant rocket power plants. This one speaks for itself. Liquid propellants are nasty things to mess around with, and I know. Some of them are quite volatile. Others require special (and expensive) equipment for their handling and storage. Fuels such as aniline are extremely toxic; one part per million in air is fatal. Liquid propellant motors are also very complicated (and expensive). They are hard to start and hard to keep running. There are too many things to go wrong with them because they are complicated. When they go bang, they do so with awesome force. Just don't mess around with liquid propellant motors; solid propellants have plenty of snort for amateur work. 5. I will always treat rocket motors and propellants with great respect and caution, remembering that many of them can be highly explosive under certain conditions. Rocket propellants contain a lot of energy wrapped up in a small amount of material. When their energy is released, it happens rapidly. 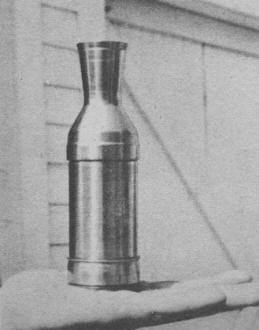 Some propellants that burn slowly and evenly in the open air will detonate rather violently when enclosed in a rocket motor. Some propellants can be ignited by blows or even static electricity. It's sheer stupidity to smoke or allow open flames in the same area with rocket propellants. Rocket propellants are nothing to be afraid of, but you certainly should respect them. 6. I will never subject rocket motors or propellants to temperatures above 125° F., not to physical shocks such as blows or dropping. The rate of chemical reactions increases as the temperature goes up. Some chemicals have what is known as a low "flash point" where they break into spontaneous combustion. If you heat up a rocket propellant, you're asking for real trouble. Don't heat up mixtures, and don't leave your rocket engines lying in the sun. Blows from dropping may crack solid propellant charges. If this happens, you'll have a dandy explosion on your hands when you touch it off. The crack creates additional burning area on the surface of the propellant, and this in turn raises the internal pressure of the motor. And you get one, big explosion. Blows, deliberate or accidental, may also damage parts of the missile or mis­align such things as fins. 7. While working with rocket propellants or standing near operating rocket motors of my own making, I will always wear the proper protective garb, which shall include a shatterproof face shield. In professional rocket work, extensive use is made of clothing and equipment which will protect the individual if something goes wrong ... and you never know when that's going to happen! Gloves, heavy coveralls, and a shatterproof face shield will help protect your body against flash burns should your prize hot-stuff suddenly decide to go "foof" on you. You'd be surprised at the extent which gloves will protect your hands, even in the event of an explosion. The face shield may save your eyes if something happens. "Stovepipe special" before (below) and after (right)! Bill Samaras (left) and Leon Callaway (who supplied pix and data). Seamless chrome-moly tubing with brazed fins. Blew apart 100' because of unstable mix. 8. I will never use dangerous chemical compounds in the construction of rocket motors; this includes potassium chlorate, the picrate family, the fulminates, the iodate compounds, and dusts of certain metals such as magnesium. I will never use high explosives as rocket propellants. Take a look at the characteristics of any proposed rocket propellant chemical before you use it; it may be highly un­stable or toxic. Potassium chlorate is a fine oxidizer, but tends to be "slightly" unstable in certain mixtures. Stay away from the entire chlorate family and use the perchlorates if you feel you must use such an oxidizer. The perchlorates are more expensive, but they contain more oxygen and are less likely to un­dergo spontaneous combustion if you happen to sneeze in their vicinity. The picrates, the fulminates, and the iodates are all highly sensitive compounds. Some of them are so sensitive that the mere alighting of a fly on them will cause them to detonate with tremendous violence. Stay clear of them. They are dangerous and should not be used in rocket propellants! Metallic dusts may appear to be excellent fuel constituents, but finely divided dusts of aluminum, zinc, and magnesium oxidize rapidly and under some of the darndest conditions you ever heard of. In addition, these dusts are highly toxic to the lungs if inhaled. One of the most common amateur rocket propellants is a mixture of zinc and sulfur. It is used by amateurs for two reasons: (a) the ingredients are easy to get, and (b) it leaves a spectacular cloud of yellowish-white smoke. As a rocket propellant, it is simply lousy, no good, and awful. Its efficiency is terrible, its burning time too short, and its physical characteristics such that it cannot be properly contained in a rocket motor. It also requires a big, heavy rocket because of its poor performance, and these big rockets can be dangerous themselves. Stay away from zinc dust and sulfur. 9. I will never use blasting caps for any purpose whatsoever. Look, chum, blasting caps were designed and are used to initiate high explosives. They do so by providing a tremendous physical wallop in the form of a blast wave. They are no good as rocket igniters. 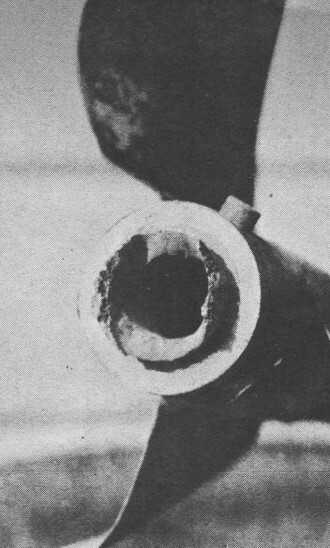 In addition, the metallic case of most blasting caps throws microscopic bits of shrapnel when it goes. A lot of folks are walking around minus eyes, hands, and teeth because they got chummy with blasting caps. 10. I will always use a remotely-operated electrical firing system to ignite rocket motors, this system to include the proper safety circuits; and I will not install electrical ignition devices in rocket motors until shortly before firing time. When you send your creation blasting off into that wild blue yonder, it's not a healthy thing to be standing right next to it. It might decide to misbehave. Get away from it, because it isn't your friend. Use a remote electrical system, because even the best fuses can be unreliable. Don't use fuses. You cannot throw the safety locks back into operation with a smoldering fuse. An electrical firing system has many advantages. You are in complete control of the instant of firing. You are also back from your rocket in case there is an explosion or a wild flight. If you have a misfire, you can remove all current from the ignition system quickly and easily, thus disarming the rocket. Don't think an electrical system is complicated. Such a system is merely a battery, a length of heavy wire, and a switch with a spring-return to the off position. For an electrical igniter, use a length of nichrome heating wire doubled and shoved up the rocket nozzle until it is in contact with the "propellant. Use plenty of voltage, never less than 6 volts. When the switch is closed, the current will cause the nichrome wire to get hot ... and woosh! A rocket motor with an igniter in it is all ready to go. For utmost safety, igniters are not installed until the rocket is ready to be fired. It is easy enough to carry the igniters separately from the motors and install them with tape when ready to go. So why take chances? 11. In flight operations, I will always choose a large, clear area well away from houses, buildings, and other habitations, the size of this area to depend upon the performance expectations of my missile, which I shall compute by means of the laws of ballistics. I will not fly missiles in the vicinity of airports or in controlled air space. 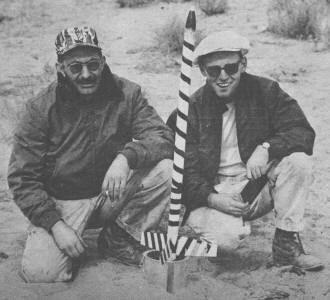 An experimental missile in flight can be a dangerous thing if it is not properly designed or if it does not contain a tested parachute system. To prevent hitting somebody or something, go out into the boondocks! Even a 6-ounce missile screaming down from 1,000-foot altitudes can be dangerous. As to performance expectations, test your missile on the ground first. Fire one of your rocket motors and use a postage scale to determine its thrust. Measure its burning time with a stop watch. Weigh the missile. From this information, you can compute its maximum speed and altitude. And the laws of ballistics are carefully explained in any high school physics book. Unless you are willing and able to read and understand a high school physics text, you shouldn't be fooling around with your own rockets. While the chances of your creation hitting an airplane are mighty slim - the government spends millions at White Sands trying to do it deliberately - you must admit that the air is getting pretty crowded these days. And your missile may be capable of reaching a very respectable altitude ... one so high that you can't see an airplane flying up there. The CAA is pretty worried about some kid's gas-pipe missile coming into the cockpit of an airliner and shaking hands with the pilot. So stay away from areas of high air traffic density such as exist around airports. Those pilots have plenty to do without worrying about your missile, too. And stay out of the controlled air space where airliners may be flying. Controlled air space starts 700 feet above the ground. They are clearly marked areas on all CAA aeronautical charts which may be obtained for 25 cents at any airport. 12. I will never fly my model missile at any angle less than 60° from the horizontal, and will fly them vertically when possible. If your missile is capable of going 1,000 feet vertically, it will go about 1,700 feet in a horizontal direction if fired at 45°. I trust you are out to get a missile up into the air, so don't make an artillery shell out of it. Ten to one you don't have the ground space required to fire a missile at less than 60° without hitting something ... maybe yourself. 13. I will take into account the fact that winds may affect the flight path of my missile, taking it into potentially unsafe areas. I will adjust my flight operations accordingly and will not fly missiles in windy weather. Your missile will probably be fin-stabilized unless you are an unknown genius who has managed to cram an inertial guidance system into a cubic inch of space with a weight of an ounce or so. Therefore, your fin-stabilized missile will have the aerodynamic characteristics of an arrow and will fly into the wind. If you have enough fin area, a high wind may tip your rocket horizontally ... and it's downright difficult to out-run a missile! Even if the weather is calm at the surface, it may be blowing at a good clip a couple of thousand feet up. You can correct for wind by tilting your launcher slightly with the wind. But be careful there, too. You may set in too much correction! 14. My model missiles will never contain explosive warheads, and 1 will never fire model missiles against targets in the air or on the ground. What are you running, a minor war or a scientific experiment? In the first place, you don't know enough about warheads, detonators, arming mechanisms, and the like to go messing around with a high explosive warhead. So forget it! Firing at targets puts model rocketry in the class with firearms, not with model aeronautics where it belongs. So submerge that urge to let one go at somebody's R/C job! 15. I will remember that my personal safety, as well as that of my friends and other people, depends upon my attitude and my actions. I will always act in a mature manner with safety uppermost in mind. I will never engage in any operation which may endanger myself or others. Life is short enough as it is. And there are plenty of risks you can take with simpler and cheaper gadgets than rockets. If you feel the urge to commit suicide, go jump off a cliff. Don't use a rocket, because you will cause trouble for the guys who are trying to do it the right way, the safe way. Some of you may know the fine legal points concerning liability, but it makes no difference if you do or not. If you hurt somebody or damage somebody's property, you'll be paying through the nose for it for years and years. If you happen to clobber somebody with your missile, they will pipe sunlight to you on alternate Wednesdays. Remember, you are working with stuff that has a lot of punch to it. And your missile is a potent object in the sky, since it will move at some pretty high speeds. Rocket motors are tremendously powerful little beasties, and rocket propellants are not something to horse around with. If you do it safely, you'll learn something and have some fun, too. 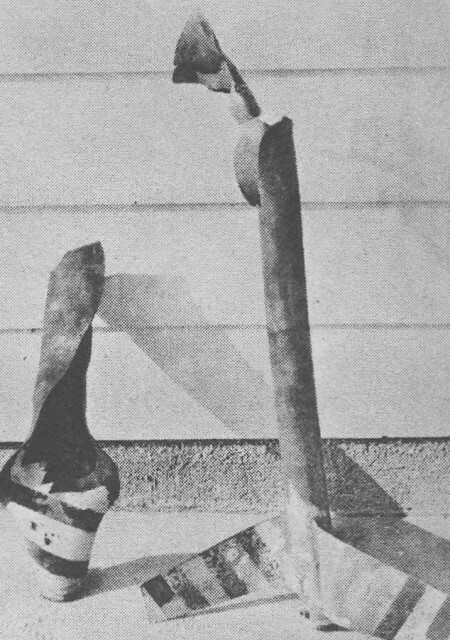 Operated properly, model rockets can be safer than a free-flight model airplane. It's up to you to prove this to your satisfaction. I sincerely hope you follow the safety rules outlined here, whether you are a member of the MMA or not. Being a rocket engineer, I well understand the thrill and excitement of building and flying model rockets. And I can under­stand your enthusiasm for them, too. But I'd like to see you stick around awhile to enjoy life. So play it safe. If you do, model rocketry will grow, and you will learn more and have more fun.